ROCKAWAY BEACH — It was a long, long winter in Rockaway Beach as residents and business-owners worked hard to recover from Hurricane Sandy. Not everything is back to what it was — construction trucks still dot the sand like seagulls, and erosion from the storm forced the closure of many popular beaches. But there's still plenty left to enjoy. Here are our picks for the best of the peninsula. The A train resumed service to Rockaway in May after the MTA worked for months to fix damaged tracks. Catch the Far Rockaway A — not a Lefferts Boulevard A — and, depending on what beach you're heading to, get off in Broad Channel for the shuttle or stay on for the first stop at Beach 67th Street. The Q35 bus runs from the last stop on the 2 and 5 trains near Brooklyn College and runs through Rockaway, ending at Beach 116th Street. Take this bus for stops at Riis Park beach, or for a day at the beaches in the more residential neighborhoods of Neponsit and Belle Harbor. You can also catch the Q53 bus off the 7 train in Woodside or pick it up off the E/F/V/R and 7 trains in Jackson Heights. For more specific directions, visit the MTA's site. The Rockaway ferry runs weekday mornings from Pier 11 and from East 34th Street in Manhattan and costs only $2 a ride. The weekend ferry, though, costs $20 plus extra for bikes and surfboards. The weekday ferry leaves you off at Beach 108th Street, and the weekend ride leaves you up at the Riis Landing in addition to Beach 108th. For full ferry schedule, visit their site. There are also hip new direct bus options from Manhattan and Brooklyn if you're not into mass transit. There's Rockabus and New York City Beach Bus — they offer similar services, so find the one you like best by trying both! Rockabus and New York City Beach Bus charter coaches from Brooklyn and Manhattan. Hang in the sun, get a tan and relax on the beach. What more could you want? If you are looking for something more active, you can take a surfing lesson from Mike Reinhardt and Mike Kololyan, the Rockaway natives behind Local's Surf School. After a warm-up on the sand and a safety lesson, you head out into the water on the big, styrofoam board. While it's much easier standing on a board on the sand than in the water, the instructors work hard to make sure you get up — at least for a little while. You may have a long way to go before you’re ready for dawn patrol at the official surfing beach, but you’re better off than you were before you got to Rockaway. Local's Surf School, Beach 67th and the beach, call 347-752-2728 or visit LocalsSurfSchool.com to reserve a lesson. Now that you know how to surf, you'll have to dress the part — and get a surfboard. Breakwater Surf Company is open in the Arverne by the Sea shopping center, right underneath the A train. The store is stocked with flip-flops, board shorts, bathing suits and more from companies like Nike, Hurley, Supra and Quicksilver. You can also rent a surfboard for the day so you can practice your shredding skills. Boarders on the Boardwalk is the beachside outpost of the main store on Beach 92nd Street. You can rent surfboards, stand-up paddle boards and bikes here, as well as pick up essentials like sunblock and t-shirts from St. James, a local surf and skate company. The ocean may get most of the shine, but don't forget about Jamaica Bay. Glenn DiResto and Robert Kaskel run the Rockaway Jet Ski out of Kaskel’s bayside restaurant, Thai Rock. What started out as a small, two-jet ski operation last year has grown, with seven jet skis in their fleet and offer tours along Jamaica Bay and into New York Harbor. Watch some of the most beautiful sunsets in the city out in the middle of the bay, as planes from John F. Kennedy Airport take-off over your head. When you’re done in the water, stay at Thai Rock for dinner and drinks. The Blue Bungalow is a locally-run store that sells jewelry, art work, and other beach-inspired items for yourself and your home. Beach 116th Street, considered to be one of the main business thoroughfares on the peninsula, is set to receive a city-led revamp and renovation as part of Hurricane Sandy recovery. This store, along with others, is part of the block's revitalization. Like them on Facebook for weekly discounts and deals. If you get to the beach in time for breakfast, grab a bagel or sandwich at Boardwalk Bagel, near the bungalows on Beach 108th Street. If you’re really daring, or hungry, try the Shark Attack, a mammoth hero with three eggs, ham, bacon, sausage, cheese and home fries. Do not swim right after eating this. Off the beaten path of boardwalk concessions, Goody’s has been a beloved local “secret” since it opened in 1989. Located on Beach Channel Drive in Arverne, it’s a walk from the beach and the boardwalk — but worth every step. We recommend the jerk chicken with oxtail gravy and mac n' cheese. If you’re headed to the beach, bring a few beef patties along for a no-fuss lunch. The owners of the Playland Motel bought the Tap and Grill bar last fall. The location, across from Rockaway's famed amusement park Playland, which closed in 1985, made it legendary. The new owners have kept an eye to this history by revamping the interior, adding a large outdoor deck and gravel pit around the back, with ping pong tables and a paddling pool and beach chairs all around. They’re renting rooms upstairs for those who want to spend more than a day in Rockaway. Each room is designed by a different artist and brunch is served on the weekends until 4 p.m. Rooms start at around $250 a night. Uma’s is a Central Asian-inspired restaurant focused on fresh, organic dishes and a cool vibe near the surfing beach. Owner Conrad Karl and his wife, Uma, said they’ve wanted to open up a restaurant for two years. It was Sandy that actually pushed them to create Uma’s, opening up a vacancy in a former martial arts school. The exposed brick wall contrasts well with the imported-tile design behind the bar, which is made from reclaimed pieces of the Rockaway boardwalk. The food, Karl said, will be fresh, with salads made from farm-to-table vegetables and unique twists on kebabs. Rockaway's only wine bar, Sayra's, features a small interior bar that opens into a large outdoor garden, with live jazz on Thursdays and movies shown on the large screen on Saturdays. The wine and beer menu is extensive but reasonably-priced, and so is the small food menu. After much of the boardwalk was destroyed during Hurricane Sandy, the Parks Department rebuilt new boardwalk “islands” centered around the concession stands on Beach 106th, Beach 97th and Beach 84th Streets and the beach. You can get around on a makeshift walkway, a lane of Shore Front Parkway closed for pedestrians and bikers, between all three. Grab an arepa and some frozen sangria at Caracas at Beach 106th Street. They’re joined this year by Conchos ice pops, which sells cold-brew coffee and smoothies in addition to frozen treats. At the 97th Street concession, grab a michelada at Low Tide Bar or a saltana and a homemade soda at the Bolivian Llama Party. And at Beach 84th street, eat a hardbody burger (double patty, double cheese) and wash it all down with a beer from the Rockaway Brewing Company at Rippers. All three concessions feature live music or DJs most weekends, so don’t be surprised if some people start dancing on the tables around you. Boardwalk island concessions, Beach 106th, 97th and 86th Street at Shore Front Parkway. Visit Rockaway Beach Club for more information. The Bungalow Bar is known for their view of sunsets as well as late-night dance parties on the deck. The Tubridy family has owned the bay-front restaurant since 1978. After seven feet of water flooded their restaurant, they spent the winter and spring cleaning up. Now, the breathtaking sunsets and packed bar have taken on a new importance. “Every person who walks in, we're just appreciative of the business and getting us back on our feet,” said Sean Tubridy, who owns the bar with his brothers and a friend. “People are willing to come down in droves by boat, train, bus, ferry — just to see the damage, the rebuilding that's taking place, and to support local businesses — and there's nothing better than that,” he said. 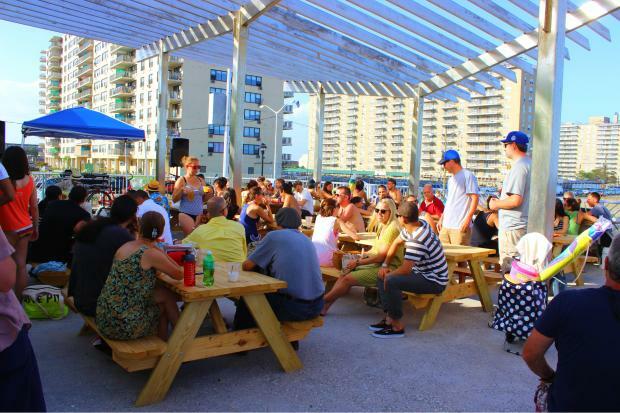 The bar boasts the “coldest beer in Queens” and features a large back deck right on the bay, where you can watch the city, and a beautiful sunrise, while eating and drinking the beach day away.